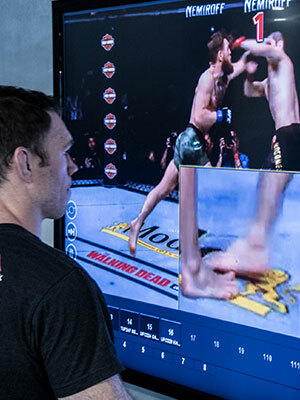 Leading that training is UFC’s Dr. Duncan French, Vice President, Performance, at UFC’s $14 million Performance Institute headquarters in Las Vegas. Dr. French’s main goal is health, wellness, and performance — to help athletes fight with less injury and proper technique. A big part of meeting that objective is achieved by using ChyronHego’s Paint sports telestration and analysis tool, which went online in September of 2017. While typically considered a live production “broadcast” tool, Paint has found its way into sports training for the same reasons broadcasters the world over use it: immediate coach/athlete engagement and descriptive analysis. Unlike other invasion sports, MMA is a one-on-one, very fast action and complex sport, where the combatants come together very quickly, making their movements hard to track. Using Paint takes the athletes and coaches to a new level of engagement, without significantly interrupting training. While there are a number of options available in the market, there were three specific key features of Paint that quickly made it the top choice for Dr. French. The third benefit of Paint is one that is familiar to all broadcasters: telestration tools. “We can look at and track parts of the body or movement patterns, and that’s invaluable,” said Dr. French. When coaches and athletes first arrive at the UFC Performance Institute and walk into the combat training space, the Paint system is the first thing they see. Being able to train others to use the Paint system meant that Griffin had to learn it first. With its straight-forward user interface, that initial training typically takes two days to fully understand the hardware and the software. And like every piece of technology, the more you use it, the more skilled you become at using it. An example would be a situational sparring session. An athlete is practicing a certain technique, such as an offensive takedown maneuver. They would do the move a number of times, review the Paint footage while still in the octagon to see how it looks, receive technical coaching and return to sparring.